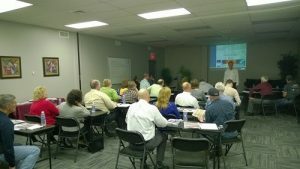 March 15, 2016 – Tuckey Restoration, a member company of DKI, North America’s largest disaster restoration contracting organization, hosted a Microbial Risk Management course on March 1, 2016 at its corporate headquarters at 170 Stover Drive. The CEC approved course was open to those involved in the structural restoration industry, and included over 25 property and casualty insurance agents, environmental professionals, and facility managers from the health care, education and non-profit sectors. Ken Larsen CR, WLS, CSDS, director of education for the Restoration Leadership Institute, taught the course, addressing the protocol and responsible approach to microbial contamination. Participants learned strategies to measure and control risk caused by bacteria commonly found in sewage backups. Tuckey Restoration provides emergency clean up, remediation, restoration, and reconstruction services after fire, water, or storm damage, as well general construction services. The company also offers industry-recognized expertise on air quality issues involving mold remediation, as well as concept development, project design services, facility maintenance, historic preservation, and new construction. You can learn more about Tuckey Restoration at www.tuckey.com.